Published: March 15, 2011 at 04:26 p.m. Updated: Sept. 24, 2012 at 04:15 p.m. 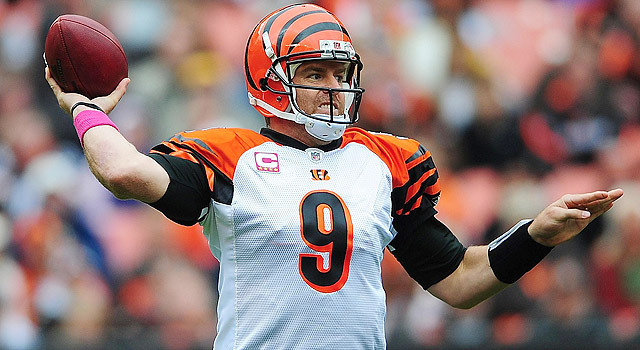 The Bengals could opt to trade Carson Palmer since he has expressed his unhappiness in Cincinnati. It's no stretch to say that the most important player on the field is the quarterback. Taking that into account, more than a quarter of the league is headed nowhere without an immediate upgrade at the position. While there could be three quarterbacks taken in the first round of the 2011 draft, unlike recent years, when Mark Sanchez, Sam Bradford, Josh Freeman, and Matthew Stafford came in and instantly solved a franchise's quarterback issue, this crop appears to need time to develop. There also doesn't appear to be enough talent in the draft to supply all the demand. Teams will have to look elsewhere to fill a hole that can cripple an organization. The current labor issues prevent trades and free agency from moving forward. That doesn't mean pro personnel departments for teams like Arizona, Carolina, Cincinnati, Miami, Minnesota, Oakland, Seattle, San Francisco, Tennessee, and Washington haven't been studying potential options that could exist when the time is right to act. Let's say three teams draft a quarterback in the first round, taking them out of the quarterback hunt. That still means several teams will be searching. Michael Vick and Peyton Manning were franchise tagged, leaving very little potential on the open market. When Matt Hasselbeck, a 12-year veteran, leads the free-agent options, followed by Marc Bulger, who didn't throw a pass last season and will turn 34 in April, trades might be the way to go. Here are the potential candidates to help quarterback-needy clubs. With seven career starts in a West Coast system, there are 319 pass attempts on tape that can be evaluated. He has completed 60.8 percent of his attempts with 11 touchdowns, 14 interceptions and 20 sacks. Kolb is slightly ahead of where Matt Schaub was when Atlanta traded him to Houston in 2007. Schaub had completed 84 of 161 for 1,033 yards with six touchdowns, six interceptions and 12 sacks. The Falcons' compensation was a flip of first-round picks, moving the Falcons from the 10th spot to eighth overall, which is equivalent to a high fourth-round pick. They also received Houston's second-round picks in 2007 and 2008. The trade-chart points from those three selections add up to 1,140 points or the value of a mid first-round pick. The Falcons came away from the deal with Jamaal Anderson, Justin Blalock and had the ammo to trade up for Sam Baker. The Eagles are looking for similar value for Kolb. Three potential landing spots would be Minnesota, Seattle or San Francisco. All three teams are committed to the West Coast system, but can one of them come to grips with the necessary compensation and get a long-term deal done with Kolb before the trade? Could the Bengals opt to go with a QB like Cam Newton with the fourth overall pick? Pat Kirwan thinks it's a definite possibility in his two-round mock draft. Palmer says he wants out, while the club says he can retire or play in Cincinnati. It's too early to tell how this will play out, but Palmer has thrown for 7,064 yards, 47 touchdowns and 33 interceptions over the past two years. He's also started all 16 games in five of the last six seasons. The Bengals have the fourth pick and should have a shot at Cam Newton or Blaine Gabbert. If they decide to take one of those guys, then trading Palmer becomes a possibility. Palmer is 31, two years younger than Donovan McNabb when he was traded to the Redskins last offseason. Still, working off that deal is a probable starting point. The McNabb compensation was a second-round pick in 2010 (37th overall) and a fourth-round choice this year. The Bengals should be enticed to take a similar deal if they secure a QB in the first round. That would give them three other picks in the top 66 to go with a young signal-caller to build around. Potential landing spots for Palmer include Arizona, San Francisco and Seattle. Carolina and Miami are also options, but neither team has a second-round pick, making a potential deal difficult. Trading Orton would mean the Broncos are ready to go with Tim Tebow. I doubt that's the case, so getting Orton out of Denver would not be easy. Orton completed 58.8 percent of his passes for 3,653 yards with 20 touchdowns and just nine interceptions. He was sacked 34 times, however. 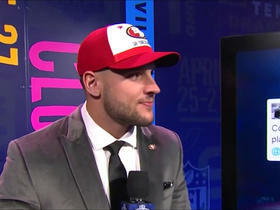 Considering Tebow was a first-round pick last year, it's unlikely the new regime would go QB again in the first round. That won't keep teams from studying Orton and eventually calling Denver about his availability when the labor issues end. Matt Hasselbeck could be the biggest name in a free-agent class lacking long-term answers at QB. Maybe Denver goes for a Hasselbeck or Bulger in free agency and then puts Orton on the block. Orton beat Seattle and Tennessee last year, throwing for 300-plus yards and two touchdowns in each game. Both of those teams could be shopping for a QB this offseason. A third-round pick in 2011 and a fifth-round choice in 2012 might get it done if he becomes available. Hasselbeck has just one 16-start season out of the last five and will turn 36 next season. Over the last two years, he has 28 starts, 29 touchdowns, 34 interceptions and 61 sacks. 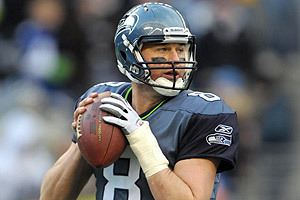 He did play well down the stretch to help Seattle win the NFC West, throwing seven touchdowns in the two playoff games. A team looking for a veteran starter that wants to take a quarterback later in the draft or already has a young option that needs more time will look at Hasselbeck. No compensation required, just a contract. If he doesn't return to Seattle, Arizona could be a good fit. While the 10-year veteran sat behind Joe Flacco last season, Bulger is being mentioned as a candidate to come in and hold down the fort. You can't hand him a job at this point in his career, but some team might offer him a chance to compete for the starting spot. Could he beat out Jimmy Clausen in Carolina? What about Chad Henne in Miami? Would he buy time to develop a Cam Newton in Cincinnati? Possibly, but the contract would have to protect the club. The extension he signed last year means he might not be released until late in the summer. No one is likely to trade for McNabb with a big bonus due and coming off his 2010 performance. If and when he hits the market will have a lot to do with possible interest. He still has talent and leadership skills, two things a team like Minnesota needs. Teams have spent time studying Young in anticipation of his eventual release. A team like the Raiders has a long history of picking up former first-round picks and has to be considered an option. He will be just 28 next season and has a 30-17 regular-season record. Depth of the free-agent class was also weakened when veterans like Seneca Wallace, Luke McCown and Kyle Boller all re-signed with their old clubs, not that anyone was looking to build a team around them at quarterback. You'll also notice Matt Flynn is missing from this list. I don't think the Packers are trading a solid, young backup, especially with Aaron Rodgers' recent concussion issues. If for some reason we revert back to the 2010 free-agent rules, all the quarterbacks with four and five years experience are not going to hit the market. That means guys like Trent Edwards, Matt Leinart, Tyler Thigpen, Troy Smith, Tarvaris Jackson, Kellen Clemens, Brodie Croyle, Matt Moore, and Drew Stanton will not be options.